Announcing BarCamp Portland 6: March 30th & 31st! 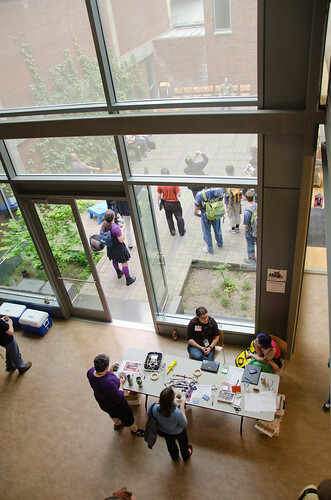 We’re happy to announce that Barcamp Portland 6 will be March 30th & 31st, 2012 at the Eliot Center in downtown Portland. That’s right, your favorite unconference in the same great unconference space as last year but with all new sessions and ideas: from knitting to nerdlings, plus the social web and its spiders, and beyond! Please RSVP on Eventbrite if you plan to attend so that we can plan accordingly. Want to help create Barcamp? Join our planning group and/or attend our next planning meeting on January 23rd from 6:30pm to 8pm at Collective Agency (calagator link). As with every Barcamp, we need your help to make the event run smoothly. Plenty of volunteer positions are available before and during the conference. Interested in sponsoring? Drop an email to sponsor@stumptownsyndicate.org.